Midnight in the Garden of Good and Evel | Write Your Own Story! ← Once More Into the Fray! When I was a kid, my hero was Evel Knievel. That swagger. That red, white, and blue jumpsuit. That cape. He was an American superhero: iconoclastic and rebellious. I even had his action figure and toy stunt bike, dreaming gossamer dreams of flying across the Snake River Canyon on a rocket cycle, cigarette dangling from my lip nonchalantly, as the world’s collective sphincter puckered. Seventies cool. As a so-called responsible adult, beavering away in the safety of my cubicle, I came to see Mr. Knievel’s accomplishments in a more cynical light. I mean, who chooses “human projectile” as a career? And he wasn’t even very good at motorcycle jumping. More often than not, he crashed! In spectacular, humiliating, bone-crushing fashion. How are we supposed to feel sympathy for him when he sets up some asinine, terribly dangerous stunt and then, predictably, gets hoisted by his own petard? Tenderizing his already suspect brain matter with the concrete. Breaking every bone in his body until you could spread his insides on a cracker. Instead of standing before an adoring throng, peeling away on his Harley in triumph, he is instead peeled up off the pavement like chewing gum, and unceremoniously hauled away in an ambulance, while his insurance agent’s sphincter puckered. Not nearly as cool as I remembered. But, something happened. My inner Knievel started to rev his engine, imperceptibly at first. Over time, it became deafening. I realized that I avoided risk with the zealotry of an insurance agent, and therefore was not living life to the fullest. Fear of failure paralyzes many people into abandoning their Dreams. Worse, it makes them circle like vultures, waiting to watch others dare to try. Secretly hoping they will fail. Waiting around to watch them die. And when they do, they pounce. Ridiculing. Trolling. TMZ’ing. Having a Hell of a lot of fun at their expense. But the vultures, the ones who never put themselves out there, will never know the reward of pursuing audaciously. Of failing nobly. And of fighting through doubt and pain time and again to try again, and keep trying until you succeed. That’s the real lesson of Evel Knievel. His choice of career notwithstanding. As a young man, he was going nowhere, in and out of jail, heading towards a wasted life. 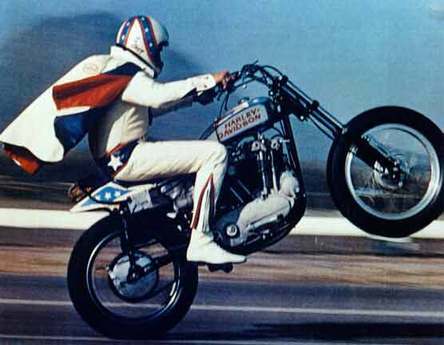 Fun fact: Ironically, Evel Knievel worked in insurance sales before embarking in a career in daredevilry. Finally, he embraced what he loved, and he went at it with everything he had. Designing his own stunts. Building his own ramps. Doing his own promotion. And he, for a brief time, was the biggest star in the world, and hero to millions. Never mind that nobody would sell him an insurance policy. This was pre-Obamacare, after all. Because he knew, even with his tenderized brain matter, that Reward takes Risk. That failure is temporary. That Daring Greatly usually looks stupid to the unimaginative vultures among us. And that chicks dig scars. Be a DAREDEVIL! Dare. Fail. Repeat. Reap your reward. This entry was posted in Culture of the Possible and tagged determination, Dreams, Evel Knievel, No fear, Overcoming failure, Persistence, Self-improvement. Bookmark the permalink.